Pie Five Pizza Co., the Dallas-based pizza trailblazer known for personalized, made-to-order pizzas prepared in less than five minutes, is rolling into Knoxville with the grand opening of its newest restaurant on Friday, October 21. Located at 9313 Kingston Pike and open from 11 a.m. to 10 p.m., Pie Five is the perfect stop for busy families in search of a quick and delicious meal with unlimited options for only $7.49. The opening marks the eighth Pie Five location opened by veteran Applebee’s franchisees Fred Gustin and Kurt Guttshall. To celebrate the grand opening, Pie Five will make a donation to the Make-A-Wish Foundation, an organization that fulfills the wishes of children who have been diagnosed with life-threatening medical conditions. 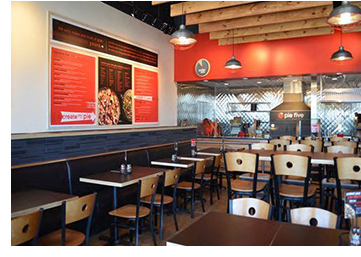 Pie Five’s fast casual dining experience delivers guests with fresh, artisan and customizable pizzas. With more than 28 fresh toppings, seven savory sauces and four made-from-scratch crusts, there are a ton of tasty combinations sure to please every member of the family. Gluten-free and vegan options are also available, so guests with dietary considerations can enjoy a thoughtful, handcrafted pizza. In addition to Pie Five’s signature pizzas, there is also a selection of freshly-tossed salads and indulgent desserts! For more information, please visit PieFivePizza.com.